Here’s the first afghan I’ve crocheted in more than 20 years! It’s basically the same pattern as the Daisy Dish Towel except I used Double crochets as the basic stitch. After completing three rounds of DC stitches, I would do one single in yellow to finish it. 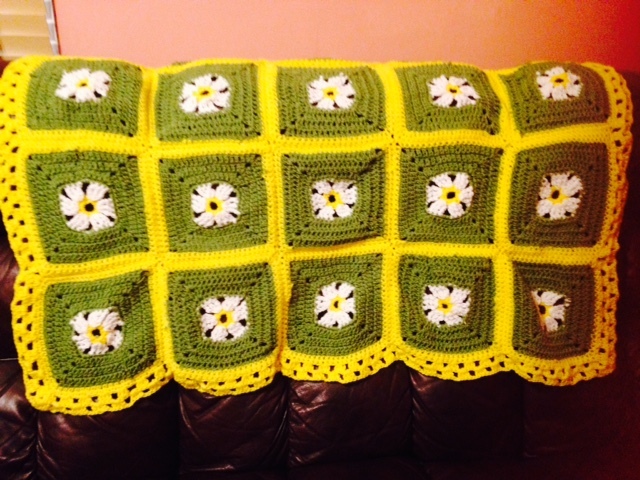 I used 25 squares, but, of course, you could make whatever size you want. Then I put them together and finished with two rounds of shell stitches in yellow to make a border. Not bad–if I say so myself! UNTIL NEXT TIME…GOD BLESS, GOOD READING & happy crocheting! ← EVEN A HULA HOOP! That sure is a pretty afghan. And you picked some pretty colors, too. Thanks, Barbara. I surprised myself. I didn’t know I could crochet so well! It’s beautiful, Lillian! Daisies are my favorite. Thanks, Marie. I was intimidated by the daisy at first. It took me awhile to get it right, but I love it too!